This is a super-easy, tasty recipe that is great for packing in lunchboxes or for a quick and simple appetizer. 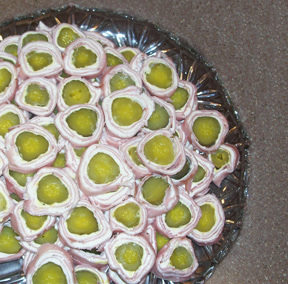 Lay out turkey (if it is too thin or you want extra turkey, use two slices), spread with softened cream cheese, and lay a pickle on one end. Roll up and eat as is or slice into rounds. Previous Post Why Grass Fed Beef?